Guitar aficionados and avid players love their guitars. They love them so much that protecting them oftentimes becomes an obsession. For that very reason, the importance of owning a guitar case for your priced possession has become almost as important as owning the guitar itself. The vast amount of cases available on the market, by a whole multitude of brands, could not make this point any more true than it already is. Whether it’s for electric, acoustic or bass guitar, the guitar case is as important as any other piece of music gear you own. Worst case scenario, there might be damage, but it would likely be minimal. What makes a guitar case so special? Well first of all, it protects your instrument from impact damage. The hard outer shell combined with the inner high-density foam creates a sound structure that cradles your guitar. This protects your instrument perfectly from scratches, dings and dents. More importantly, the impact absorbing characteristics of this well-designed structure absorbs impacts in such a way that when dropped, the guitar can escape the incident unscathed. Keep in mind that a bare guitar if dropped from even 1 foot high can become quite damaged with an array of dents and scratches and possibly other breakage. A very expensive Gibson guitar with an angled headstock can easily snap at the neck joint from a small fall like that. If dropped from a higher altitude, say 2-5 feet, the guitar will likely end up completely unplayable. 5 feet might seem a little excessive, but in the rare situation a fall like that might happen, inside a case there is a much higher chance of the guitar surviving. Worst case scenario, there might be damage, but it would likely be minimal. The outer shell of most guitar cases is made out of hard, impact absorbing material. Many of the common outer shell materials include: plywood, artificial wood laminates, molded ABS plastics and in some cases even aluminum or other metals. Wooden or laminate outer layers are usually covered in Tolex, the same material used to cover the wood of guitar amplifier cabinets. Plastic ones are usually bare as well as the metal ones, although a few might be painted. Cases completely covered in stickers are not uncommon, but this is something mostly done by the owner, not the factory. Inside the hard outer structure lies an inner structure of foam. Usually medium to low density EPS foam (or Styrofoam) but in some instances higher density foam can be found. This foam structure absorbs most of the impact vibrations that might have made it through the outer structure. It’s meant to support the guitar and keep it from moving at all once the case is closed. In between the foam structure and the guitar is a thin layer of super soft material meant to be a final protection factor for your guitar’s finish. This inner layer is often called plush or crushed velvet fabric and in some rare instances even wool can be found in there. Most manufacturers tend to go with very bright colors like fuchsia, green shades, oranges or reds, although white and black inner linings are not uncommon. Some companies, such as Coffin Case, take it to the extremes of making the interior of the case look like a quilted dead person’s coffin. Inside this deeper area of the case you can often find small compartments to store picks, straps, strings, capos, cables and all manner of guitar accessories. On the outside the case usually latches closed with at least 2 latches. Many times, one of more of these uses a simple key to lock it closed. The use of numerous latches ensures that if one fails, the guitar will not fall out of the case and get ruined. Acoustic guitars needs special protection from the elements. Guitar cases come in all kinds of shapes and sizes. Often dictated but the end instrument it is designed for, it may be made to fit bass, acoustic or electric guitars. 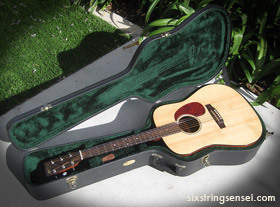 Acoustic guitar cases tend to be thicker to fit the bigger instrument. Electric guitar cases are usually much thinner and smaller in profile than acoustic or bass guitar cases. Same goes for smaller instruments like mandolins and ukuleles – those cases are usually quite small. Since the best guitar cases are those that hug your instrument perfectly inside, many guitar cases are designed for a specific instrument brand and model. For example, there are many cases that are designed specifically to fit only a Gibson Les Paul, or only a Fender Stratocaster. Apart from the typical wood and plastic cases there are some “hybrids” out there. They are like soft fabric gig bags on the outside, but feature hard foam in the inside. They combine the added protection of hard foam with the lightweight, smaller size and lower cost of an outer fabric layer. They usually close shut via a combination of zippers and Velcro. There is also breed of guitar cases that came out of necessity due to the increase in air travel security. These are called ATA cases. ATA stands for Air Transport Association. These are cases designed with air travel in mind. They must meet certain criteria in order to be ATA approved. They are designed for, and subjected to tests that simulate air travel and where certain impacts and specific continuous vibration patterns are common. They offer increased protection for your guitar. However, they are more expensive and are still not indestructible. Some ATA cases feature no locks while other have TSA (Transport Safety Administration) locks that allow TSA officers to easily open the locks in order to do routine inspections. The benefits of TSA approved locks are obvious: One can check the locked guitar case with the airline baggage check department, without having to worry about TSA breaking your locks in order to get into the case. They can easily open the locks and inspect your case while the rest of the time your instrument remains off-limits to other airline personnel. 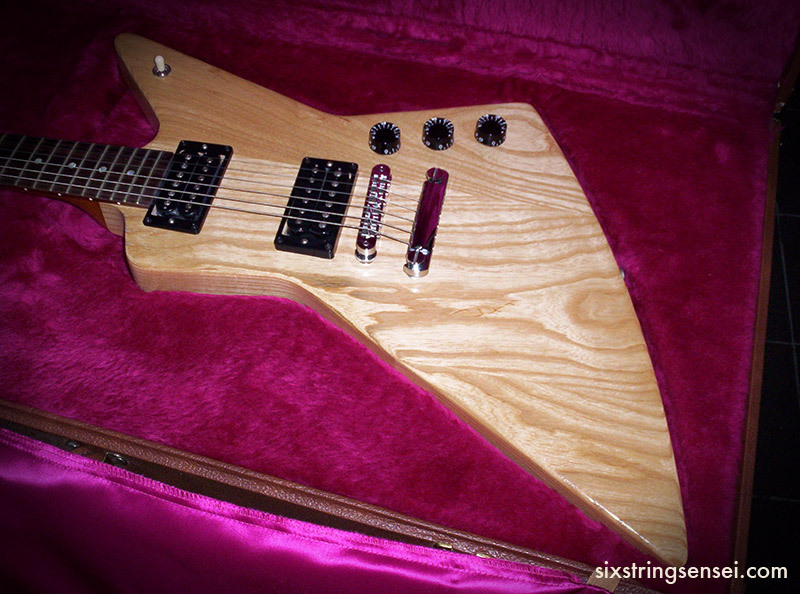 See how perfectly this dedicated Gibson Explorer case fits the guitar body. Just about every major guitar brand out there has their own guitar case line to fit their guitars. These included Fender, Gibson, Ibanez, Martin, Ovation and host of others. They add value to the guitars because apart from protecting the instrument, as the guitar ages and later becomes a classic or a vintage collectible, having the original case that came with the guitar is a very important appraisal consideration. A buyer is more likely to want to buy a vintage instrument that includes its original factory hard shell case over one that has an aftermarket case. Even if the aftermarket case is of higher quality. 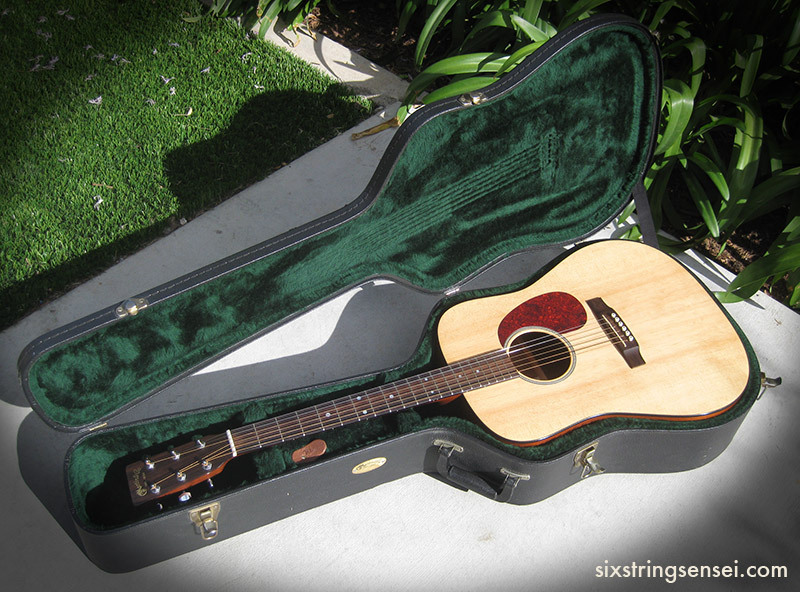 In some cases, a buyer will refuse to buy an instrument if it does not include its original case. And speaking of aftermarket cases… There are brands that focus their efforts specifically on aftermarket cases. Some of these brands include SKB, Gator and the previously mentioned Coffin Case. Some of these cases are better at protecting your guitar than the factory models. Many guitarists will save the original factory cases at home so they hold their value, in which case they will take an aftermarket case to gigs. Most of the ATA approved cases available on the market are actually manufactured by these aftermarket brands. Apart from the vintage cases, other cases that are often rare and valuable are those that only fit a certain instrument only. For example, cases designed specifically to fit the odd body shapes of Gibson’s Flying V and Explorer guitars. While there are many cases that fit Strats and Les Pauls, finding a case for a Flying V or Explorer can be a little bit harder. Same goes for Ibanez’s odd shaped guitars like the Ice Man and the Destroyer. And don’t forget the case for your pedalboard and your guitar amp. Many guitarists overlook those. But when you spend so much money on an amp or an effects pedal collection, it’s in your best interest to protect them as well. This should be enough information to get your settled in choosing a guitar case for your current axe, or possibly in choosing a guitar that comes with it’s own hard shell case. Even if you cannot find the right case for your needs, you can search for a custom case manufacturer and have them build you one to spec. As you can see, there’s no excuse not to protect your guitar. If your budget does not allow a branded, Tolex covered hard shell guitar case, you can always by a less expensive shop brand. If your budget does not allow for one of those either, then a molded foam case with a fabric outer cover should be your next best bet. If you keep your eyes open you can easily spot special discount events and even used guitar cases for sale. Just don’t settle for a gig bag unless you are only carrying your guitar from your home to your guitar teacher’s teaching room. Once you start gigging, a proper hard shell case is a must! Otherwise you might end up learning your lesson the hard – and expensive –way!